One student of the esoteric recently revealed an important truth that has been forgotten since the days when the Egyptian Pharaohs one revered the ankh. He said the Egyptian Stele of Revealing is depicted in the tall slender figure of Nuit, the symbol of the Universe, bent over from "above the gemmed azure" in ecstasy "to kiss the secret ardors of Hadit." The word azure means a light purplish blue color. Those who have studied Aleister Crowley’s Book of the Law understand that while Nuit represents the living universe, Hadit is the energy that makes everything go. Nu is the feminine component of our universe while Had is the masculine. They are inseparable for they must work together to make the universe not only exist, but run. This, in a nutshell, appears to be a description of Zen Consciousness. We understand that to grasp this concept, one might consider a very small dot that can barely be seen by the naked eye that is surrounded by a circle so vast that it expands beyond the human ability to see it. By thinking of these two abstracts, and considering compressing the dot much as possible, and expanding the outer limits of the circle toward infinity, the student of Zen might come to an understanding of all. 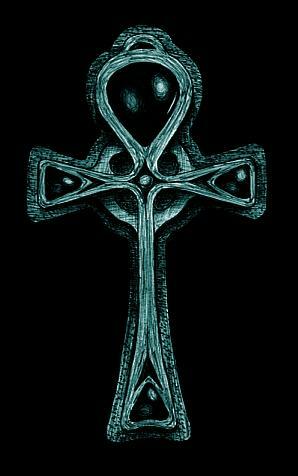 The circle at the top of the ankh is the very image of Nuit, bending over to kiss Hadit. The circle is therefore symbolic of the vast universe. Rather than a cross, the Tau image below is a picture of three powerful rays of light. Notice that each spreads wider as it stretches farther from the center. Thus the image might be interpreted to be that of "a jewel-locked star in the heavens." More than this, the Milky Way, the galaxy in which our solar system spins, is calculated by scientists to have about 100 billion suns, or stars. Each of these stars is part of a vast communication system. All of the stars are full of the energy of the cosmos and communicating with one another, and with the planets that circle them. By amazing coincidence, or perhaps by design, a healthy adult human brain contains about 100 billion neurons, all of them, just like the stars, in constant communication with one another. Thus there exists a peculiar parallel between the human brain and our galaxy. Science today is developing the technology for advancing the computer to match the mechanics of the human brain. We are becoming like gods with the very power of creation. It is possible that we could develop such a matrix and put ourselves within it before we destroy ourselves? And this might happen because we failed to tend to the garden . . . the planet on which we live.